Last night I commemorated the centennial of the Armenian Genocide by visiting San Francisco’s city hall, which was lit up in red, blue, and orange to match the Armenian flag. Unfortunately, the fire department forbid me and the hundreds of people waiting outside to join the speeches and dance performance in the already packed hall, so I left with nothing but a few good photos. 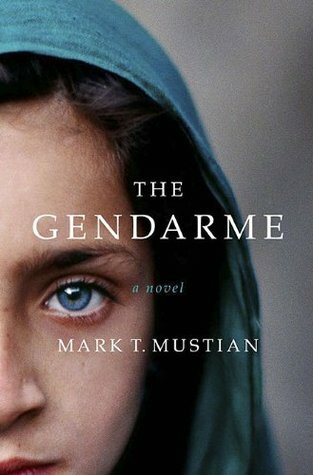 This experience mirrored my minor disappointment while reading Mark T. Mustian’s The Gendarme (2010). The historical fiction novel is narrated by Ahmet Khan, or his preferred Americanized name Emmett Conn, who is in his 90s and suffering from disturbing dreams caused by a brain tumor. These dreams are actually flashbacks during the Armenian Genocide, in which Emmett participated as a gendarme–a Turkish soldier. His job was to send Armenian deportees through the desert to Syria, but he quickly learned that this march was to their deaths as both countries’ governments had no intention of keeping them alive. During the trek, Emmett falls in love with an inappropriately young Armenian girl named Araxie. Despite the barbarity he commits on this journey, he risks his life to protect hers. When they finally arrive in Syria, he must decide how to escape their wretched fate. I must warn you that this book is horrifyingly graphic. Not only do Emmett and his fellow gendarmes sexually assault and murder innocent people, those who are spared succumb to debilitating diseases. It takes a long time before the reader can sympathize with Emmett for being on the wrong side of history. However, in the end, I felt pity for this man for his life of suffering, both when he was young committing atrocities and in his old age when his family commits him to an institution for his mental instability. You are already aware that Emmett and Araxie did not escape the genocide together, and it’s especially heartbreaking to watch Emmett realize his crimes after decades of post-traumatic repression. The Gendarme isn’t the most well-written story, and many readers will find its nonlinear structure aggravating. I should also point out that although Mustian and I are both Armenians, I appreciated reading a Turk’s perspective–however abhorrent it may be. This book cannot compare to The Sandcastle Girls in terms of literary prowess, but both are excellent tales of this historical tragedy that does not get enough attention. The Gendarme made me sob at the end, but more importantly, it made me grateful for what my ancestors suffered so that my family could live on. This entry was posted in Book Review and tagged Armenia, Armenian Genocide, book review, Historical fiction, Mark T. Mustian, The Gendarme, Turkey by Book Club Babe. Bookmark the permalink.